These slippers may not look like overly special, but they’re guaranteed to shoot to the top of every parent’s Christmas list. You know that eye-watering pain of stepping on a piece of Lego? Well, it seems Lego has been listening to all that cursing – and they’ve designed slippers to put an end to our agony. The company has teamed up with French advertising agency Brand Station to create protective slippers, which have thick padding on the bottom to take the edge off standing on the small plastic bricks. They’re interchangeable between left and right foot and have an open back so they can be easily slipped on during the night (peak Lego accident time). The agency shared a video on Facebook, showing how the slippers are made. But there’s a catch. 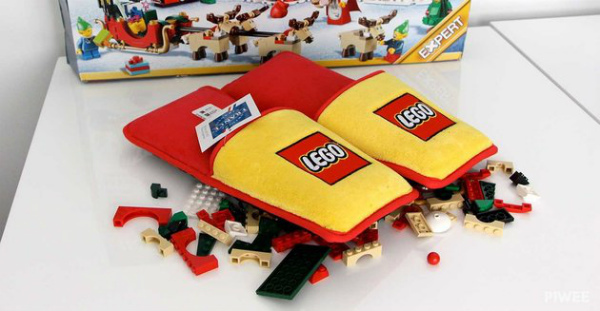 French blog Piwee reports only 1500 pairs have been made, and they’ll be given away randomly to people who fill out their Christmas list on the Lego France website. Here’s hoping they prove so popular that they’re distributed worldwide very soon!